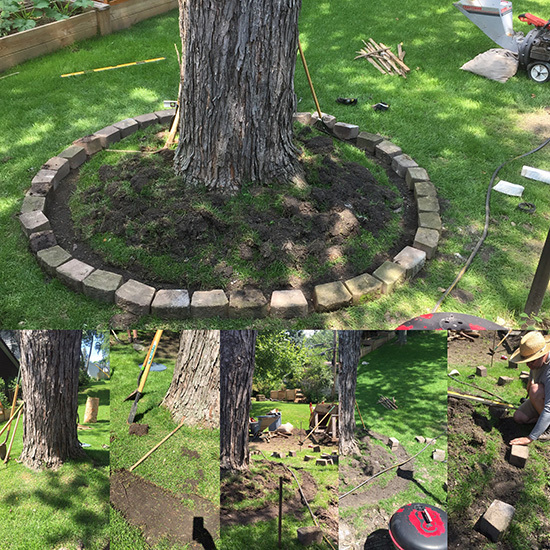 So, we had all these pavers from around the yard that we’ve been pulling out (our yard looks like hell, overall, full disclosure) and I decided I need to make a tree ring with them around the tree closest to our house. 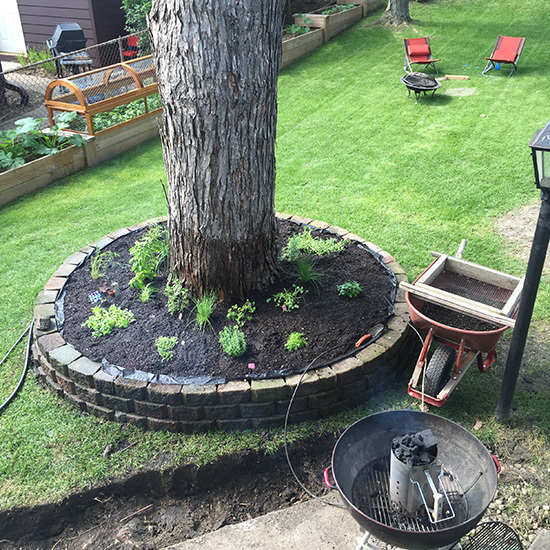 The roots were well above ground and I didn’t think it looked that great in all honesty. A super fast overview for the tl;dr crowd. 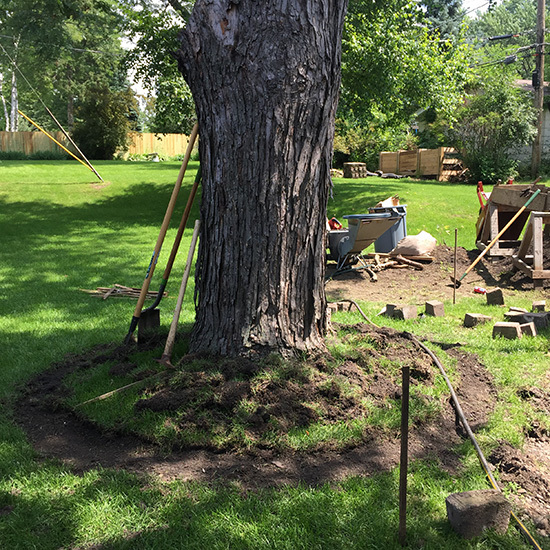 I started out by taking a shovel and digging a rough hole around the base of the tree. This was fairly quick and easy and I was all proud of myself. 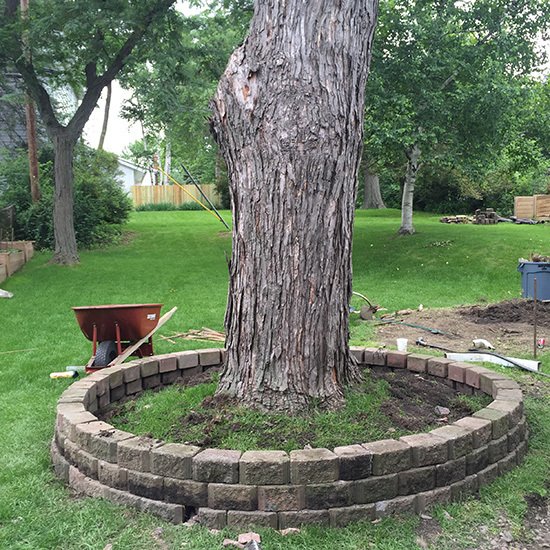 I set pavers all around it to rough-in how many I would need. I should have been more careful so I didn’t have to end up chopping any pavers in half but I wasn’t so, in the end, Dale has to use chisel to knock some of the pavers down (also we didn’t want to hurt the roots of the tree so the first row of pavers were chipped out on the bottom in places to accommodate the tree roots). 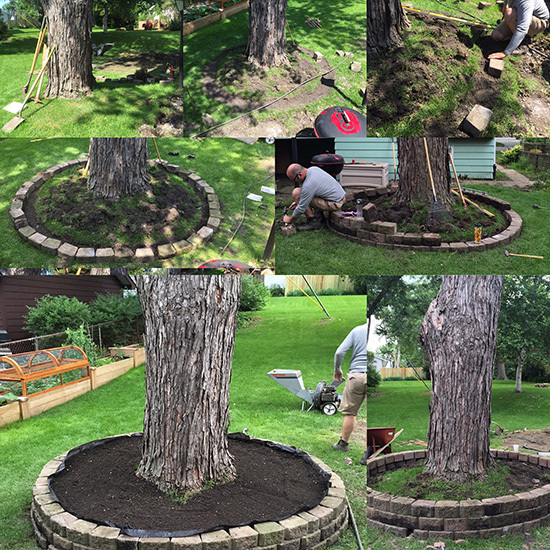 Here’s an overview of the first phase, which was the hardest part by far (actually, the hardest part was digging the pavers out of the ground from all over other parts of the lawn and picking them up and putting them in place–it was like a challenge on The Biggest Loser and I won). Dale and Bela were a big help! 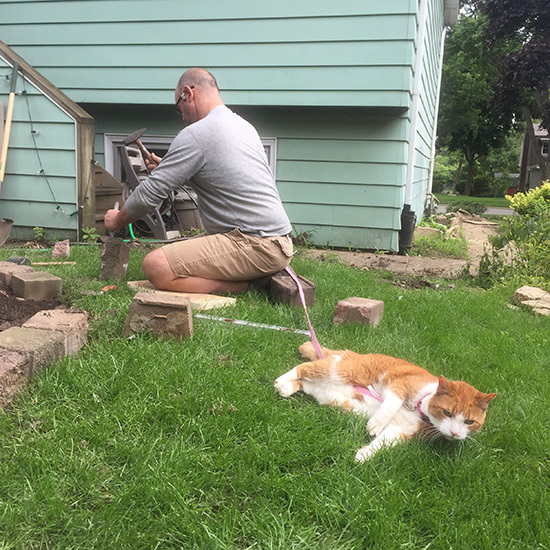 Dale helped me by providing me with a long level that allowed me to level the first row of pavers (so I could dig deeper into the ground for some, shore up others, depending on what was needed). 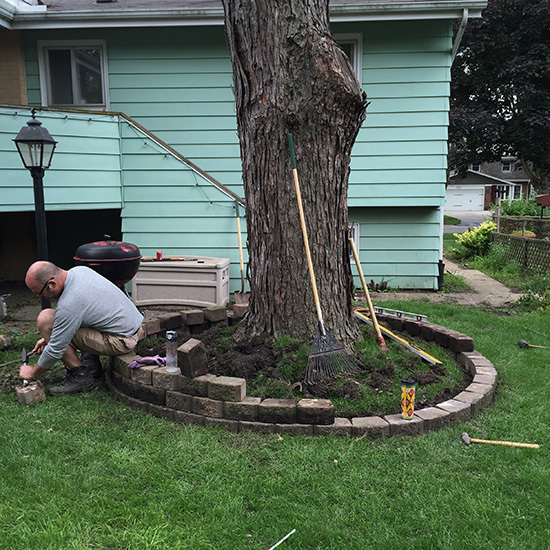 Dale did all the chipping of pavers to ensure they fit around the tree roots. Bela was there for moral support. We were basically sweaty and miserable and this project was kinda hard? Dale kept me going, tho. 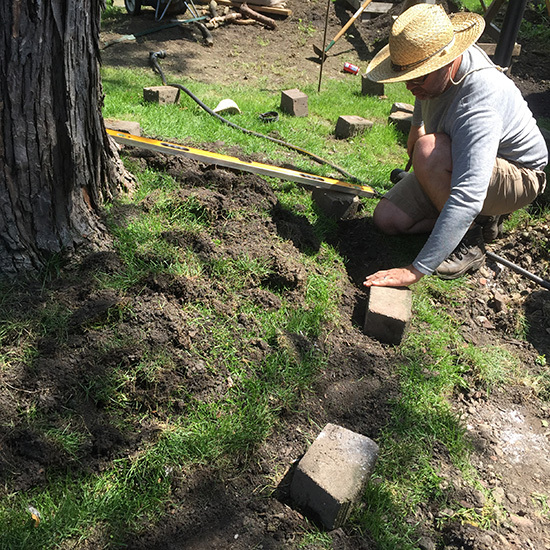 You can see how dirty the pavers are as I ran out and needed to dig more out of the ground from around the yard, lifting two at a time and bringing them over to the ring. We went with 3 rows of stone. Dale filled in a couple of gaps and then we had to go buy the dirt to fill it in. 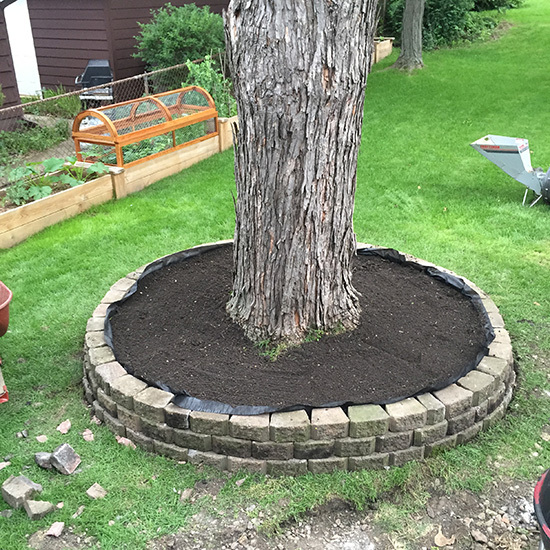 I was pretty pleased with the result and decided to turn the tree ring into an herb garden–it’s quick and easy access next to our back door makes it the perfect place to snag fresh herbs. The herbs grew like gangbusters within a couple of weeks! See that giant hole? That’s where some of the pavers were. It’s filled in with dirt but we still have a LONG way to go on the yard! (In the background you can see our raised garden beds and Dale’s addition: a topper for the strawberry patch. I’ll post about that piece soon). Looks awesome and its a great idea I would love to make one like that around my tree in the yard.